Having consistently, though recreationally, trained, run, and race for about three years, I’ve never heard of the Susan G. Komen Race for the Cure until now–until I am a direct beneficiary of the race. 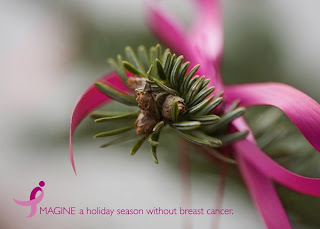 The cost of my upcoming surgery will be covered by my local hospital’s High Risk Breast Cancer Program, which applies for grants from the Komen Breast Cancer Foundation. As soon as I realized the connection, I registered (on the last day of registration) to run the race myself. Aside from sponsoring Ivy for her run, I raised about $500 for my run, thanks to supportive friends and family. Admittedly, I feel slightly guilty for using the funds of the program when there are many other women who may be in the same, or worse, predicament who are in more desperate financial needs even though the program director assured me that they are able, and happy, to cover my costs. 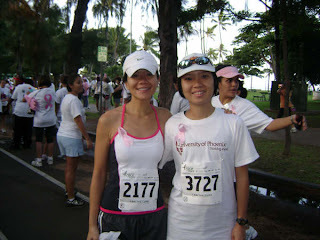 I ran the race last Sunday, October 19, 2008. Seeing the sea of men and women runners, many of whom bore the names of loved ones who have either lost their battles or are in the midst of fighting cancer, made me a little emotional. Momentarily, however, I became infuriated by certain people cheating in the race, even though it’s not a timed race or an awarded one. There was a 1-mile run/walk those people could have signed up for, WHY join a 5-K and cheat the distance?? Why bother to wake up so early on a Sunday morning if you are not in for it? I know it doesn’t hurt anyone that they didn’t go the distance, but it’s nonetheless disconcerting. Principle, principle, principle! Or maybe they are ‘objectivists.’ …now I’m digressing. I ran the race well, despite very tired legs from running a 14-miler the day before. This is one race I will always remember, one that I will continue to support even if, God forbids, I can no longer run it myself.